Benefit of blood pressure (BP)-lowering treatment on various outcomes was evaluated by meta-analyses restricted to randomized controlled trials (RCTs) measuring all major outcomes. 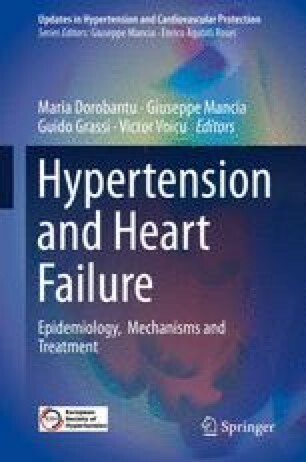 The question whether BP-lowering and each class of antihypertensive agents prevent “new-onset” heart failure was explored by additional meta-analyses limited to RCTs excluding baseline heart failure from randomization. Thirty-five BP-lowering RCTs measured all outcomes, and heart failure [RR 0.63 (0.52–0.75)] and stroke [RR 0.58 (0.49–0.68)] were the outcomes most effectively prevented. Heart failure and stroke reductions were significantly related to systolic BP, diastolic BP, and pulse pressure reductions. In 18 BP-lowering RCTs excluding baseline heart failure from recruitment, heart failure reduction (“new-onset” heart failure) [RR 0.58 (0.44–0.75)] was very similar to that observed in the entire set of RCTs. In meta-analyses of head-to-head comparisons of different antihypertensive classes, calcium antagonists were inferior in preventing “new-onset” heart failure [RR 1.16 (1.01–1.33)]. However, this inferiority disappeared when meta-analysis was limited to RCTs allowing concomitant use of diuretics, beta-blockers, or renin-angiotensin system blockers, also in the calcium antagonist group [RR 0.96 (0.81–1.12)]. BP-lowering treatment effectively prevents “new-onset” heart failure. It is suggested that BP lowering by calcium antagonists is effective as BP lowering by other drugs in preventing “new-onset” heart failure, unless the trial design creates an unbalance against calcium antagonists. The data, concepts, and figures reported in this chapter are largely taken from an original article published by the authors in the Journal of Hypertension . Wolters Kluwer Health, Inc., is thanked for permission.